The Easter Blue mining claim is located in the farthest northern reaches of the Royston Mining District. While gold and silver have been located in great quantities in the area, the district is famous for its turquoise. The Easter Blue is noted as one of the most famous and original mines in the district. While the Royal Blue and Royston Coalition Mines were patented and worked, and worked, and worked until there was nothing left, the Easter Blue continued to produce gem quality turquoise that was mined primarily by hand and commanded a great premium. The Easter Blue has not been addressed since the early 1980s. The mines are open cuts with some old adits which have been opened and cut along shear zones by machinery. The mine(s) are easily accessible with even a low clearance vehicle but will require some mechanized work to expose the quartz and turquoise bodies. “The Easter Blue, Blue Mountain, or Blue Gem mine (no. 47, pI. 1) is in sec. 27, T. 7 N., R. 39 E., about 8 miles northwest from the Royston district. Turquoise occurs as thin veinlets along altered shear zones In a fine-grained, white quartzite. About half a mile north of the mine, there Is a tungsten prospect at the contact between limestone and quartz monzonite. Unfortunately, Mr. Morrissey’s accounting can be quickly invalidated, at least in part by United States Bureau of Land Management Records which show that the Easter Blue and Blue Gem were held by Clifford Gibson starting in 1931 and 1943 . Mr Gibson let his claims lapse in 1991 and they were acquired by Bridgeport Gold. “The color of Easter Blue turquoise is unique among turquoise found in the Royston Mining District. Most turquoise found in southwestern Nevada is a shade of green. Instead, Easter Blue stones are a deep shade of blue, which has been compared to a robin’s egg. The matrix ranges from dark brown to a very bright golden or even an orange shade. This turquoise is exceedingly beautiful when set into sterling silver. 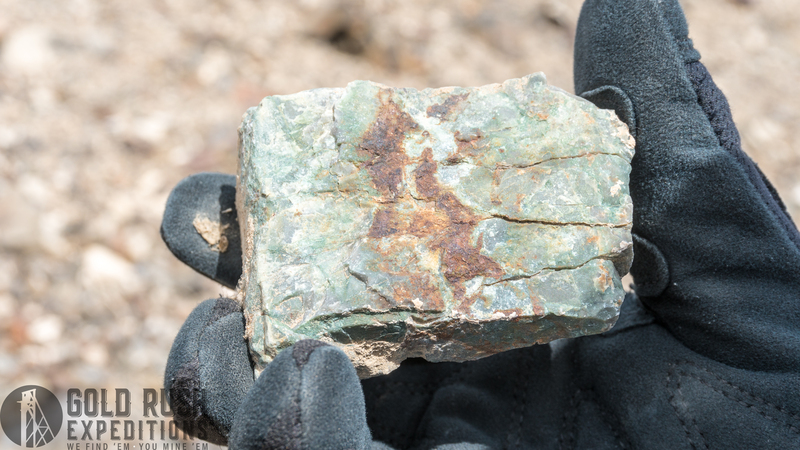 The Easter Blue/Blue Gem mine near Battle Mountain, Nevada produced a great variety of turquoise, from intense blues to deep green combinations with a hard, irregularly distributed matrix. While there are other mines in Nevada of the same name, the Battle Mountain Blue Gem mine & the Tonapah Blue Gem Mine, which began production in 1934 and is now closed, yielded the most valuable Blue Gem turquoise because of its rich color and its hardness. It is greatly desired by collectors. One of our favorites! There seems to be no contention that the mine was located in the early 1900s and produced some of the most brilliant and one of a kind turquoise ever mined in the state of Nevada. The mines were held by Peter King and then sold to, contrary to popular lore, the mines were held by Clifford Gibson for many years, from 1931 to 1991, then by Bridgeport Gold until 2016, when Bridgeport let the claims lapse in 2016, Gold Rush Expeditions, Inc. staked claims over the more interesting cuts and obvious deposits. The Blue Gem and Easter Blue are somewhat synonymous with each other but should be noted that they are separate deposits and nearly a mile from each other. The Mining claim has good access and could be reached with a low clearance two wheel drive vehicle in 2017. There are a series of open cuts and trenches on the property. These expose various layers of rock which have been mined for the minuscule bits of the Easter Blue turquoise. The property should be worked by hand. A dozer is recommended for clearing overburden and slough to reveal deposits, it is not possible to work the deposits by anything but hand with hammers and chisels. The turquoise deposits are veinlets in altered shear zones in a fine-grained white quartzite. The rock is almost completely argillized near the shear zones, and is silicified along the mineralized fractures. The Mine is ready to be worked in its current state and would require a bond associated with a Notice of Operation.